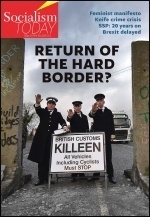 From: The Socialist issue 1035, 27 March 2019: General election now! The world's top five oil and gas companies have spent $1 billion since the 2015 Paris climate agreement on lobbying and PR to obstruct policies addressing climate change. Meanwhile, youth climate strikes continue to spread. Climate NGO InfluenceMap revealed that ExxonMobil, Shell, Chevron, BP and Total spend a total of $195 million a year on these media and political campaigns. Despite superficially lauding the Paris agreement, behind the scenes the fossil fuel giants have used lobby groups to attack the details of regulations, and invested in social media, to push their profit agenda. BP sunk $13 million alone into a campaign that successfully stopped a carbon tax in Washington state, USA. Since the Paris agreement, emissions have continued to rise. The International Energy Agency, which advises the richest economies on fuel markets, reported a 1.4% increase to 32.5 gigatons of carbon in 2017 - the equivalent of adding 170 million cars to the road. Meanwhile, the five biggest firms racked up total profits of $55 billion, with just $3.6 billion invested in low-carbon schemes. The UN's Intergovernmental Panel on Climate Change has called for a 45% drop in fossil fuel use in order to limit warming by 2030 to the 1.5°C target laid out in the Paris accords. It also estimates that it would cost $900 billion a year to implement the programme it says is needed. Nevertheless, two studies by science journal Nature in 2017 concluded that not one of the major industrialised countries was meeting the Paris targets or implementing policies to reach them. President Trump even tried to withdraw from the Paris accords in 2017. He was unable to as the earliest leaving date is 2020. However, the agreement is non-binding, with no sanctions for not meeting the agreed targets, and no way of enforcing them even if there were. It is absolutely clear that big corporations and their representatives in capitalist governments cannot and will not solve this crisis. At the same time, the world watched on Friday 15 March as students across the planet participated in a one-day school strike as part of the developing youth movement against climate change. There is clearly a huge mood among young people to fight on this issue. They see no real future for themselves on a planet ravaged by environmental catastrophe - but also no future in terms of huge student debt, zero-hour contracts and poverty wages. 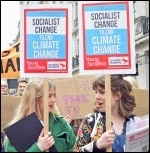 Following the radicalising consciousness around climate change, the Guardian has reported the appearance of 'Labour for a Green New Deal' - no doubt inspired by the US 'Green New Deal' proposal accepted by Democratic Party congresswoman and self-described socialist Alexandria Ocasio-Cortez. 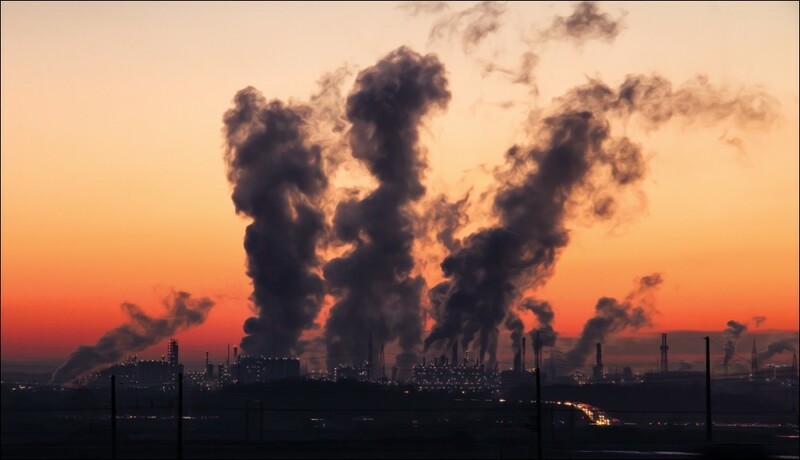 Its director calls for a ban on fossil fuel subsidies, mass investment in public transport, and "green industrialisation" to replace the jobs capitalism destroyed in the deindustrialised regions. The article also points to Shadow Chancellor John McDonnell's 'Alternative Models of Ownership' report, which argues for expanding democratic public ownership. All these policies would be a welcome step in the right direction. However, as the Socialist remarked last year on the 'Alternative Models' report, "it assumes the capitalist elite in Britain will acquiesce to its proposals and therefore has no plans to counter their sabotage." To prevent the bosses undermining such policies, we need to take all the banks and big corporations out of their hands. Nationalising Britain's top 150 firms under democratic workers' control and management would allow socialist planning of the economy to meet the needs of all. The Guardian quotes a comment that "climate change is fundamentally about class, because it means chaos for the many while the few profit." This is true. But the Socialist Party says it is also about class because only working-class action can implement the programme needed to overcome it. The multinationals and super-rich elites have shown time and again they will ignore laws and circumvent policies that harm their profits. The working class has enormous power - we can cut off the flow of profits in an instant, by organising, striking and occupying. And winning Labour to such policies cannot be separated from the need to boot out the pro-capitalist Blairites and democratise the party. This should include mandatory reselection for MPs, a democratic collective voice for the trade unions, and MPs to only take an average worker's wage. Trade union leaders should be coordinating action and campaigning among their members to build a mass movement to improve the living standards of working-class people, boot out the capitalist governments of the super-rich like Trump and the Tories, and link up with the brilliant school student strikes. This could be the first step towards a movement to reorganise society on socialist lines, to win liberation from the oppression of the capitalist system and threat of environmental destruction for the whole planet and its inhabitants.